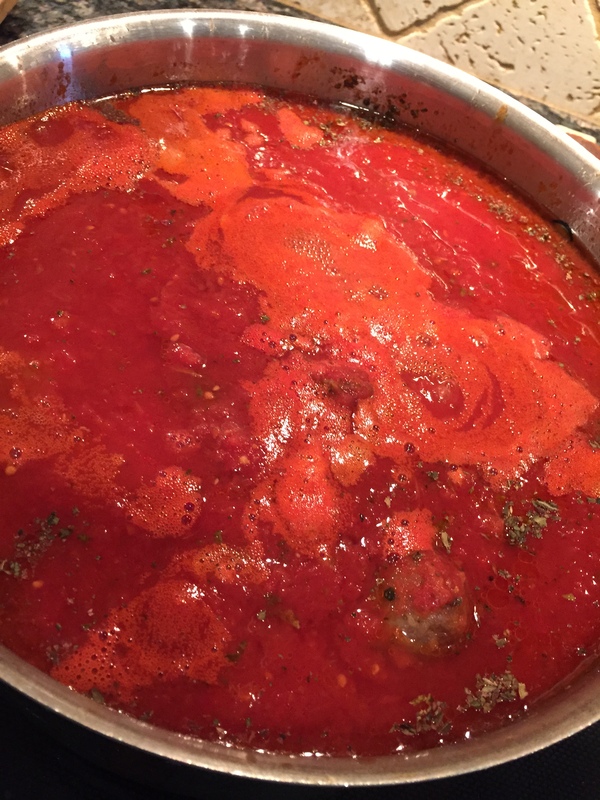 I have been making my own Italian Tomato Sauce since my very early 20’s. I grew up in a small town, Emerson, NJ, which was a suburb of NYC. Emerson at that time was mostly Italian, or at least to me, it seemed to be mostly Italian. Almost all of our family friends were Italian, a lady across the street, Mrs. Natale was Italian and the lady and man across the street from us and next door to Mrs. Natale, in a little bungalow, were Italian. Mr. and Mrs. Lavalatta were a much older couple and lived in that little bungalow. Mr. Lavalatta’s name was Vito, so my family called them Mr. and Mrs. Vito. They spoke a very broken Italian-English and probably the only one who understood them was my father, or at least he pretended to understand… she talked with her hands a lot. Mrs. Vito, a very small woman who always wore a grayish or bluish small-flowered house dress, would come over to our house every morning, and kneel down and pray to the white Mother Mary statue that my mother had in our front yard in front of our raised garden under the front picture window. She would come and visit my father almost every day. She never knocked, she would just come over, open the door and yell “Walk, Walk…” my father’s name was Walt, but “Walk” was how she pronounced his name. Most of the time he was sitting at the kitchen table and they would have coffee together. I don’t really remember Mr. Vito coming over, but he and Mrs. Vito would sit out on their front porch every night and watch all of us kids play. If we did something that they felt they needed to reprimand us for, she would chase us while shaking her broom. We found out years later, that Mr. and Mrs. Vit were never married, they were just living together, which was a real shock to all of us. The Lavalatta’s grew grapes (along with other garden vegetables) in their yard and every year they would make wine. I think it was in their basement, I’m not sure, I was pretty young, but they did it the old fashioned way, stomping on the grapes with their feet (or at least that’s the story we all heard). When it was ready, she would bring a glass jar of wine over for my father. It was so strong and and vinegary, a spoon could stand up in it, but my dad always had a glass with her anyway. She would sometimes bring over some Italian food that she made. My family is not Italian, my father’s side is Welsh and English, and my mother’s side is Irish and English (although talking to my mother, we really are only Irish). Along with Mrs. Vito, almost all of my father’s friends were Italian, so he adapted their ways and he cooked like an Italian. My Godfather, Uncle Charlie, was very Italian, he and my father were best friends and Uncle Charlie was one of the family. My father and him were friends until the day Uncle Charlie died when he was in his 70’s. So I grew up mostly with Italian families, they were all my “Aunts” and “Uncles” and we grew up with Italian foods. As it turned out, my first husband was Italian, and now, my second is also Italian, we’ve been married for 30+ years. 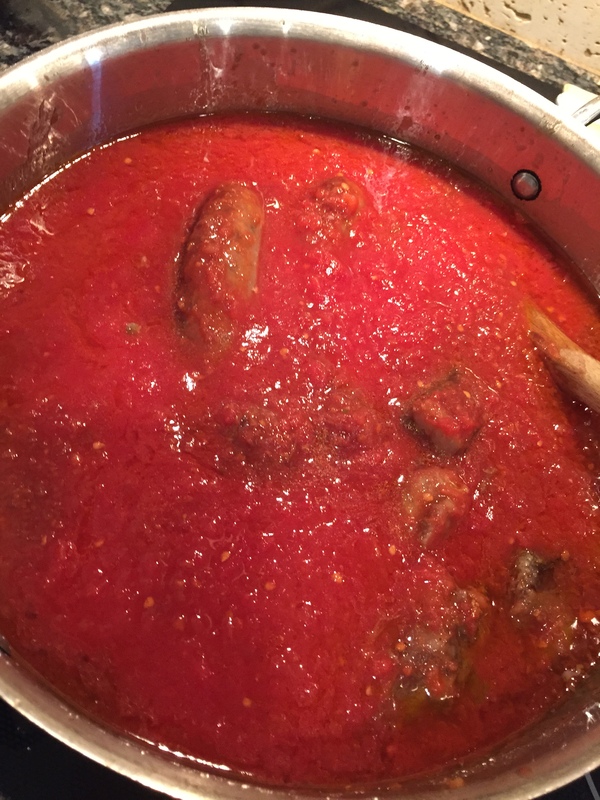 My father taught me how to make tomato sauce when I moved out and got married and then I also learned more about it from my mother-in-law at the time, Mrs. Russo. Over the years and by the time of my second marriage (sometime iin my mid-20’s), my sauce was pretty much, what I thought was perfected. But over the years it’s changed and gotten better. I used to grow my own plum tomatoes in my garden (so did my dad) and I would use them for my sauce. Every August, we were overloaded with Italian plum tomatoes which I would use to make fresh tomato sauce. If using fresh tomatoes, you have to add another couple of hours to the simmering, but there is nothing like tomato sauce from tomatoes from the garden. We had so many tomatoes, too many to use for one pot of sauce, so, I would cook them up (just peel and cook with basil for a little bit, nothing else), then put the cooked tomatoes in containers and freeze them for the winter. That way, almost all winter long I could make tomato sauce from fresh garden tomatoes. When the fresh tomatoes ran out, I would have to use canned tomatoes and the only tomatoes that I would use were the blue Tutto Rosso canned Italian plum tomatoes… they were whole in the can and ONLY the blue can, the green cans did not make a good sauce. No other brands of canned tomatoes would make a really good pot of sauce. I was in Shop-Rite (a NJ food store) and there was an older couple (Italian) shopping for tomatoes. I was with my husband (Tom) and she started telling us about the tomatoes and how they are the best for tomato sauce. Well we tried them, and she was right! Before that I would use the Progresso Tomatoes, but from that point on, I would only use the blue can of the Tutto Rosso’s. Then when I moved to Texas in 2008 (many years later), none of the stores around here carried the Tutto Rosso tomatoes. I tried different brands and nothing tasted like my NJ tomato sauce, so I had to start figuring it out. 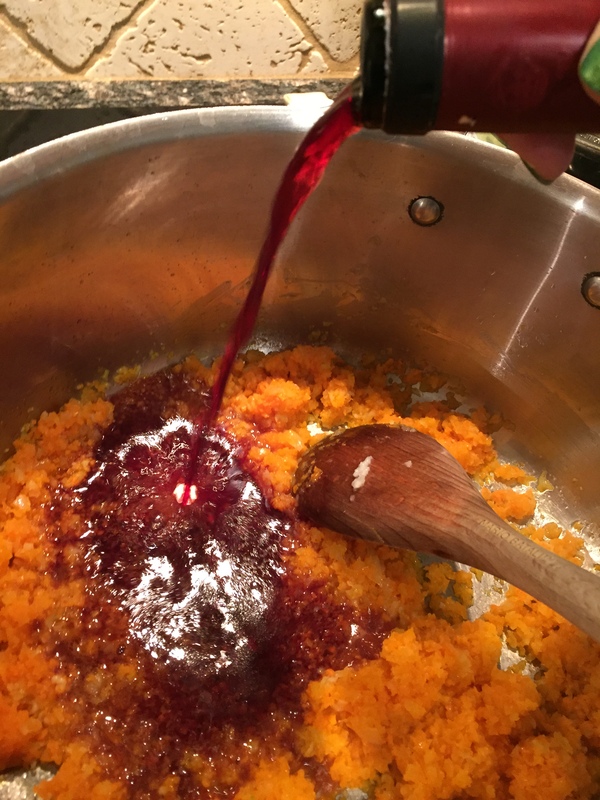 I tried some different things and then started adding very finely chopped carrots (chopped fine in a food processor) and red wine (only use a good quality red wine). That made a huge difference, you can’t taste the carrots, but they took the acidity and tartness away. 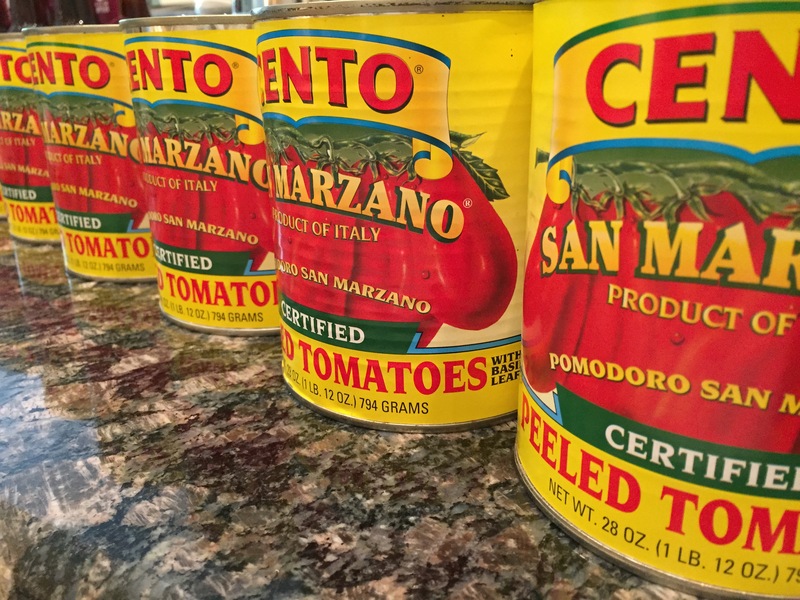 Then I discovered the Cento brand of San Marzano Italian Plum Tomatoes in the can (I’ve tried other San Marzano tomatoes in the can, but Cento seems to be the best for my sauce). I was so happy that I finally found canned tomatoes that work (summers are too hot here in Texas and you really can’t grow those good tomatoes that you can grow back in NJ… after all, it is the Garden State and it’s called that for a reason). I decided to keep using the carrots and my sauce now is better than ever! So, that’s the background of my tomato sauce (or, gravy, as Italians call it, but to me, gravy is brown, so this is sauce) and why I am a good Italian cook. The sauce is kind of an all day project. It takes a good 3-5 hrs to simmer. I make a big pot of it, so that it can be frozen in batches and you can get about 3-4 meals out of it. So this is how I make it. 4-5 28 oz. cans of Cento San Marzano Whole Plum tomatoes (not puree, not chopped only the whole San Marzano) -OR-Tutto Rosso tomatoes, blue can only, whole plum tomatoes. salt to taste (I don’t measure, but it’s probably about 2 teaspoons or so. Start with less and taste after the sauce has cooked for about an hour. You can always add more salt while it’s cooking but you can’t take it out). Braciole if you can find it, or you can make it. For the meats, I put them on a pan in the oven (preheated at 350º) for about a half hour, and that should be done before starting the sauce. By the time you have the sauce in the pot, the meats will be ready to add to the sauce. The sauce takes at minimum, 3 hours to cook, so plan ahead, I find it best if it cooks 4-5 hours. 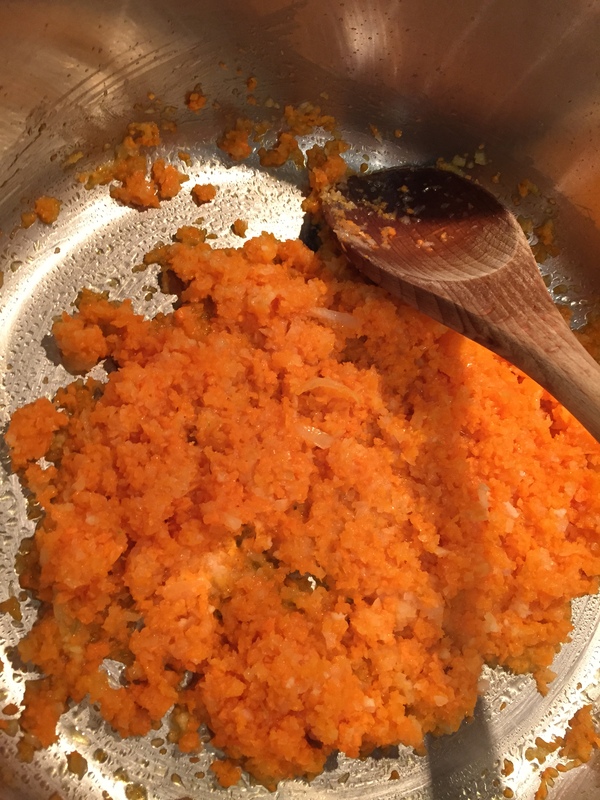 I finely chop the onion in a food processor so it’s very fine, then I do the same with the carrots. I use a big heavy sauce pot and put olive oil in the bottom. Then I add the chopped onion and cook it a bit, then the carrots and garlic and cook them together, maybe about 15 mins or so. Then I add some wine, I just add it… maybe 1/3 of a cup, I’m not sure, I just add it, and cook it down a bit with the vegetables in the pot. Then I start adding the tomatoes. I use a tomato crusher, but you can also use a potato masher. Add 4 cans of tomatoes to the pot to leave room for the meats. After crushing all 4 cans of tomatoes, the meats should now be ready (they do not have to be fully cooked because they will cook for hours in the sauce). If you have a small can (12-14 oz) of fire-roasted tomatoes, that adds a really nice flavor to the sauce. I can’t always find it so I don’t always use it, but it does add a little something special to the sauce. Add the meats to the sauce. If there is still room in the pot, I add one more can of tomatoes with the crusher. If you don’t have crusher, then crush them in a bowl separately since you can’t mash the sauce now with the meats in it. Add salt, then add dried basil. I like dried basil better than fresh in sauce. I also rub it together in my hands to crush it into the sauce. I NEVER add oregano. Oregano will give the sauce a bitter taste. I’ve never tried fresh oregano, but maybe that would be good, it would probably be milder than dried oregano. Lower the heat so it’s a slow simmer and simmer the sauce for at least 3 hours. Make sure to stir the sauce so that it doesn’t stick to or burn on the bottom of the pot. Here is the finished sauce, it’s nice and thick and does not need any tomato paste. 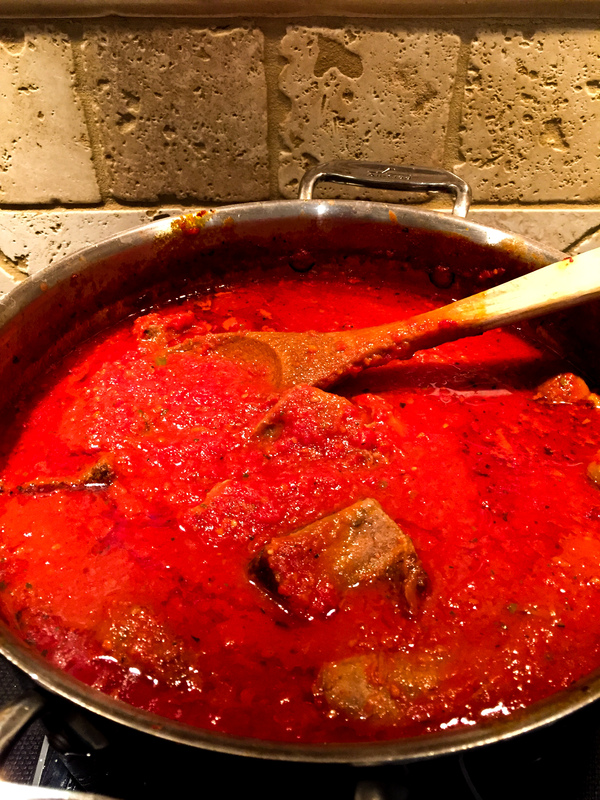 If you do want to add some tomato paste, use only 1/2 of a small can and add to the sauce after adding the tomatoes. I like the texture and flavor of the sauce without the tomato paste. When the sauce is ready, put a large pot of water on the stove and bring it to a boil, add salt to the water (2 tablespoons? I’m not sure, I just put in what I always put in) and then cook the pasta (al dente, of course). My favorites pastas are penne, farfalle and rigatoni. Always use freshly grated cheese, I have never once bought that grated cheese in the green container. Freshly grated cheese is so much better, the flavor and texture of it and it’s very easy to grate. Because they are hard cheeses they have a a considerably long refrigerator shelf life. Serve it with a tomato salad or green salad, good wine and some really good Italian bread. I have learned to feel the bread so I can normally tell before cutting and tasting it, whether or not it’s a good bread. A good Italian or French bread will have a slight crust and it will be dense inside. With practice you can press the bread and feel the crust and the density of the bread. If you can’t get a good bread, I have a really good recipe for a crusty French bread… but thats for another post on another day. As always, thank you so much for reading this!